Rumpelstiltskin arrives home to Millah. The couple was happy and in love back then. He gives her the disappointing news that he has been called to fight in the Ogre Wars. She believes this will be dangerous. He agrees but also feels that it will help him to not gain the same reputation as his father who was known as a coward. She tells him when he returns they will raise a family. Rumpel is now a soldier. He is instructed that he will guard a cart with a prisoner. From within the cart he hears someone call his name. Rumpel lifts up the canvas and reveals a child with red hair and stitches where her eyes should be. She tells him that she is very thirsty. The girl then tells him she is a seer and can see the future. Rumpel is skeptical but she tells him she knows of his father and that Millah is pregnant. This alarms Rumpel. He gives the girl water. She reveals eyes in her hands and tells him that tomorrow he will die in battle. Rumpel accuses the Seer of lying and she responds by telling him tomorrow the army will arrive with cows. The next day Rumpel stands with another soldier talking. They see an injured soldier being carried away. The man with him admits he is jealous because that man will not have to fight and die. Just then another man comes out and tells the men to grab a ‘cow’ for their horse. Rumpel is stunned by what he hears and asks the man what he is talking about. The man tells him ‘cow’ is a term for a leather saddle. Rumpel panics and heads to the cart to see the Seer. She is gone. He spots a hammer close by. Not knowing what else to do Rumpel uses the hammer injure his own leg. Rumpel returns home. Millah is there with a baby. She tells him she named the child Baelfire. Rumpel remarks that is a strong name and she responds by telling him the child will need it with a father who is a known coward. Rumpel pleads with Millah that he saved himself because the Seer told him she was with child and he would die in battle. She tells him he should have fought and died. He tells her she cannot mean that. An angry Millah hands the boy off to Rumpel and leaves the house. Rumpel is now at peace with his son. He tells the baby that he will never leave him. Years later the magical Rumpelstiltskin seeks that same Seer. He finds her in the forest. The Seer is now an adult. He tells her that by escaping his fate he ruined his life. 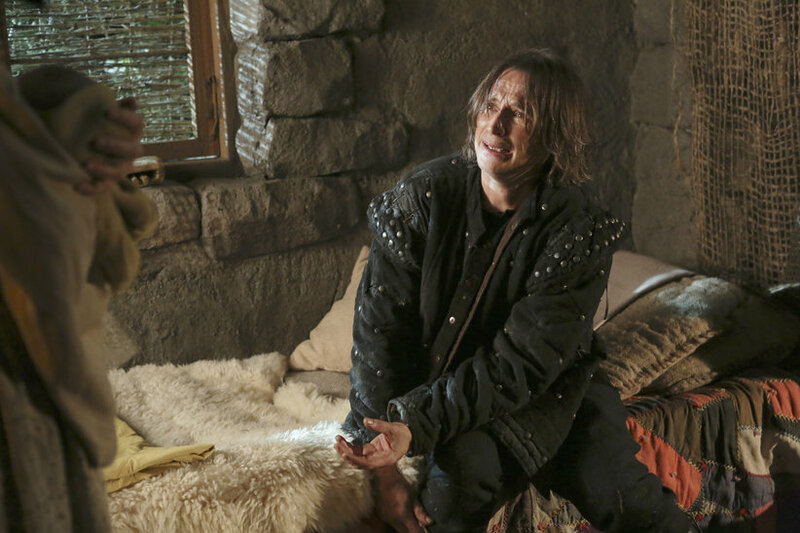 Rumpel uses magic to hurt the woman so she will give him more information on the future. She knows he is looking for his son. The Seer tells him that many years from now he will find his son. She also tells him there will be a curse but he will not be the one to break it. The Seer tells Rumpel to take her burden away. Rumpel drains the Seer of her power. Rupel realizes that the future looks like puzzle pieces and that do not make sense. He tells her he knows why she called her power a burden. The Seer who writhes on the ground gives him some last pieces of information. She tells him that one day a little boy will bring him to his son. The little boy will end up Rumpel’s downfall. Rumpel simply tells her he will kill the boy. Mr. Gold is in New York with Emma and Henry. They go an apartment building where they believe Bae may be. Emma looks through the directory but has no idea what name Bae may be using. Emma notices an apartment listed as ‘vacant.’ She buzzes the apartment and they are surprised when a male answers. She claims to be with UPS. They see a man climb down the side of the building and take off. Emma chases him and as she leaves Gold tells her by catching him she will satisfy her deal with him. Emma finally catches up with the man and they collide. They look at each other and Emma is stunned. The man is Neal. Emma and Neal stand up and face each other. She asks him if he is Mr. Gold’s son. Neal does not know who she is talking about. This time she refers to Gold as Rumpelstiltskin. This causes a reaction in Neal. Emma is furious and demands to know if Neal knew who she was. Neal insists they go and talk in a bar. Gold and Henry wait for Emma to return with Bae. Gold buys a hot dog for Henry and thanks him for being the one to bring Emma to town. Henry tells Gold that he has forgiven Emma for giving him up and is sure Bae will forgive him as well. In the bar Emma continues asking Neal if he knew who she was while they were together. Neal tells her that this is not the case and had he known he would have stayed away from her. He has been hiding from his father for years. Emma tells Neal that he left her to go to prison. Finally Neal explains his encounter with August. He tells Emma he left her so that she could fulfill her destiny and go home. Neal then tells her that he believes everything happens they way it is supposed to and something good must have happened from their meeting. Emma hesitates and tells him that is not true and all that happened for her was a prison sentence. Neal notices that Emma still wears the keychain he bought her. Emma snatches it off her own neck and demands he come with her so she can fulfill her bargain with Gold/Rumpelstiltskin. He tells her to tell his father that she lost him. Emma calls Mary and quickly explains the story. Mary insists that Emma tell Henry the truth. Henry has the right to know he has a father who is alive. Gold is visibly nervous to Henry. Henry asks why. Gold tells Henry that things don’t always happen for him the way that he thinks that they will. Henry points out that Gold can see the future. Gold explains that seeing the future is not a good gift to have. He explains to the child that the future looks like puzzle pieces and it is never what you think. Emma arrives and tells them that she lost Bae. Gold insists that they break into Bae’s apartment and wait for him. Emma tries to discourage this. Henry is excited and tells Gold he will be his look out. Inside the apartment Gold looks for clues about his son. Emma spots the dream catcher Neal got with her in Tallahassee. She picks it up drawing the attention of Gold. Gold realizes she is holding something back from him and she insists that she is not. As Gold loses his temper Emma sends Henry to the bathroom. Gold threatens Emma for breaking a deal with him. Bae/Neal enters the apartment and tells Gold to leave her alone. Neal tells Gold that he came back for Emma because he knows how Gold is. He did not want Emma hurt. Gold tries to put the pieces of the puzzle together and wants to know how they know each other. Henry enters the room. Gold looks at the boy and then at them realizing the situation. Neal is stunned to see Henry and asks who he is. He asks Henry how old he is and Henry tells him 11. He wants to know if this is his son. Henry tells Neal that his father was a firefighter who died. Emma has tears in her eyes as she admits to Henry that Neal is his real father. Henry goes out the window. Emma follows him. Neal finally agrees to give Gold three minutes to talk. Outside Emma apologizes for lying to Henry. He tells her that she is just as bad as I am. She explains she lied because Neal was a thief and she felt he was a bad guy. Henry wants to meet his father. Gold wants to make things up to the Neal. He offers to take him back to Storybrooke and make him 14 again so they can make up for lost time. Neal tells him that idea is ridiculous. Gold then offers to erase his memories. Neal tells him for years he has felt abandoned by his father who chose magic over him. He tells him that every night he dreams about falling through the portal. Neal and Emma talk in the kitchen. She tells Neal not to break Henry’s heart. Neal goes outside and stands with Henry. Henry introduces himself. He tells Neal that he is not mad at him because he knows Neal did not know. This makes him smile. Neal puts an arm around Henry as they look out at the city. Gold watches them out the window. My mother has finally changed into clothes more appropriate to Storybrooke. I tell her that Emma and Gold took Henry. Hook bursts in on us. He wants to know where they are. If Gold has left Storybrooke he has no magic and can be killed. Cora stops Hook and tells him he cannot leave and instead they should find the dagger. I go to the hospital to pay a visit to Belle. Of course she does not remember me. I ask her about the dagger and she looks puzzled. With magic I knock her out and enchant the contents of her purse. I watch the float by until I find an index card with what looks like a library book number on it. At the library I search through books with mother and Hook. Mother finally finds a piece of paper hidden in the book shelf. Hook tells us that it is a map and he will be able to read it. We believe the map will lead us to the dagger. Meanwhile, Mary fills David in on the new additions to their family tree. David is stunned that Gold is Henry’s other grandfather. Mary believes this may be a good thing that will bring everyone together. At the hospital Greg is on the phone. He does not want to leave Storybrooke right away. He plays back a video he captured on his phone. The video is of me standing over an unconscious Belle with contents of her purse levitating. At the library Hook deciphers the map. He is angry when Cora tells him there are other plans. Mother uses magic to knock him out. She tells me the dagger will be more useful to us. She tells me that we can use its powers to kill everyone who is keeping me from Henry.